Main idea is to put the positive energy at local and global levels in the movement, with the aim to heal the earth. Every creative act is based on the principle of creative activity. Creative activity is possible to be "connected" under the condition of positive energy. Such energy is the positive thoughts and feelings of all involved in the movement. As well as the physical act - the digging and installation of the spiral channel. In quantum physics, the positive energy moving in the clockwise direction. 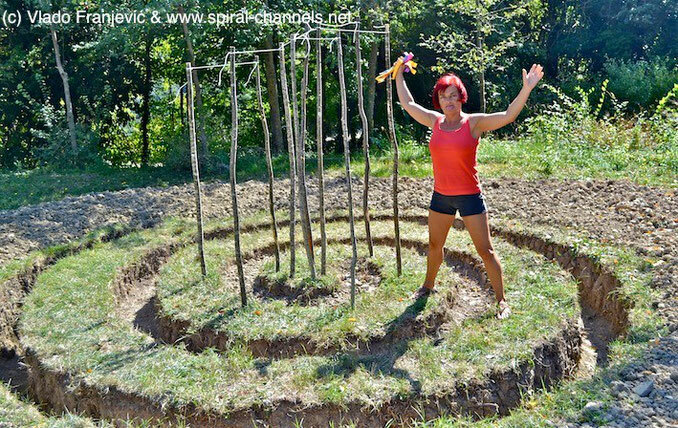 The movement of the spiral in a positive direction and vertically into the ground (in the example Vlado's creation) and the movement of other spiral (symbolically represented and specified with the wood insert different heights and with the cord tied together) necessarily leads only to one - the healing effect on the earth. Moreover, with its own work in the physical sense, with its own sweat and blisters on the hands of their own, the artist couple shows the world the gratitude and mindfulness! Selection of a locality (a country) is left to the universal spiral-Do - on the basis of previous experience (realization of five channels in 5 European countries) the affairs and conditions are created, and so it comes to invitations. Certain contacts and Internet searches, as in previous spiral channel realizations participating people as a whole are of particular importance. Nothing happens by chance in this context. It is always important exactly this particular place at a given time to heal given moment! In the final presentation of the channel, in and around the channel to local residents to be involved (if they have it). Or any other artist at the site of creation might find. This will all together for the subject aware that has to do with the local and for the opportunity to spread the positive energy. At the same time the consciousness is awakened and promoted the need for a global thinking and action, and a healthy holding together.